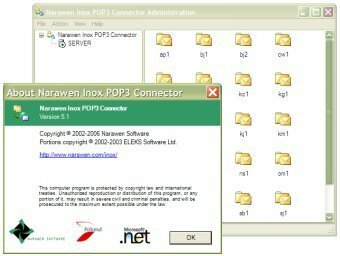 Narawen Inox POP3 Connector is mail gateway software delivering messages from Internet POP3 mailboxes to mailboxes located at your corporate messaging server such as Microsoft Exchange or IBM Lotus Domino. Application runs automaticallly in background as operating system service. 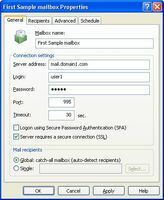 Periodically it downloads all messages from POP3 mailboxes, routes them to recipients, and sends using SMTP protocol. Setup Wizard based on Microsoft Windows Installer standard, easy to use Administration Application, and comprehensive Help allow system administrators to install, configure and run Narawen Inox POP3 Connector in efficient way. Every customer receives 180-day Technical Support package which guarantees smooth deployment and constant access to newest software releases. Simple per-server licensing model without any additional costs on additional mailboxes makes investment costs fixed and effective.